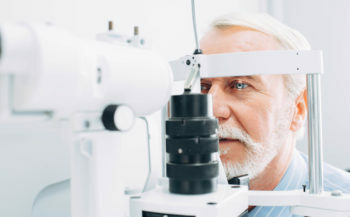 AMD is the number one cause of vision loss for people over the age of 55. It is a common retinal disease that blurs the central vision necessary for everyday tasks such as reading, writing, and driving. AMD occurs when there is a loss of visual cells in the macula and the central part of the retina, that allow you to see fine details. The rate of AMD in our population has increased as life expectancy increases. AMD affects 18 million people, and 1 in 10 over the age of 65 years. Our senior population is projected to double by 2030, and with few treatment options and no known cure, the percentage of those suffering from AMD is expected to dramatically increase. Early detection of AMD is important for slowing the progression of the disease. Effective treatment is available for five percent of individuals with late-stage wet AMD. This treatment consists of therapeutic drug injections in the eye that can slow vision loss in some patients. Monitoring progression of the disease with a primary care physician is important. 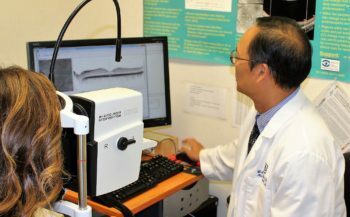 Scientists are currently working to find treatment options for dry AMD. At this time none exist. 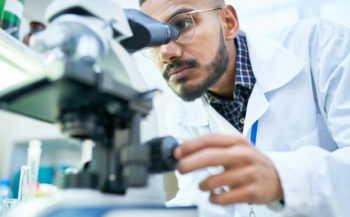 How is the Retina Foundation researching AMD? AMD is a highly complex and individualized disease. A diagnosis cannot be made unless there is visible damage to the structure of the eye. Diagnosis of the disease is measured through visual acuity testing. At this time there are no predictors of disease progression. Research continues to develop solutions to measure predictors, manage disease progression, and treatments. 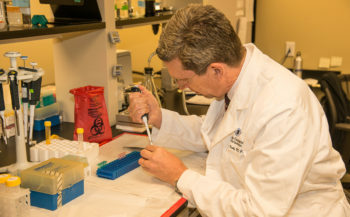 Research at the Retina Foundation is supported by both public and private sector funds. Financial support is provided in the form of research grants and private donations. We count on the National Institute of Health, National Eye Institute, Food and Drug Administration, Genentech, Allergan, and the W. W. Caruth, Jr. Foundation as some of our many valued giving partners. The Clinical Center of Innovation for Age-Related Macular Degeneration was supported by an initial $2.5 million dollar grant from the W. W. Caruth, Jr. Foundation at the Communities Foundation of Texas, and an Anonymous $1 million dollar gift. The Clinical Center uses a patient centered approach that involves a referral to the Clinical Center from an eye doctor. Our researchers then communicate the patient’s results from their in-depth vision evaluation back to the referring eye doctor. The eye doctor will follow-up with the patient to implement a future treatment plan based on the results. The Clinical Center is focused on exploring and developing individualized treatment for patients who are in different stages of AMD. 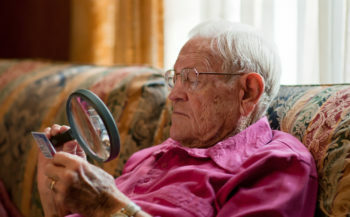 Read about our research initiatives for age-related macular degeneration.